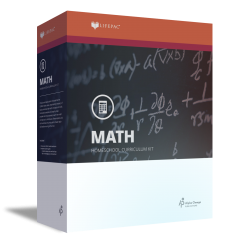 With LIFEPAC 11th Grade Math, student's can master advanced algebra! This course's concept-by-concept approach and clearly written lessons make comprehension easy. Students receive the tools to understand: Set, Structure, and Function; Numbers, Sentences, and Problems; Linear Equations and Inequalities; Radical Expressions; and Quadratic Relations and Systems. LIFEPAC 11th Grade Math takes the guesswork out of understanding more advanced algebraic processes. Easy-to-understand worktexts, which also cover exponential functions, counting principles, and real numbers, will build your student's knowledge of math. The LIFEPAC 11th Grade Math Set contains ten worktexts and a teacher's guide (these may also be purchased individually).